David Chiarelli - Latest Edition! : Paris Diary: To the Arc de Triumph! Today we took a long leisurely stroll up the Champs Elysee to the Arc of Triumph. There's a long tree lined roadside promenade lined with park benches. I found it quite tranquil. About half way up the Champs the shopping district begins. It was incredibly expensive. A local told us that's just because its a tourist area. I never saw so many middle eastern woman in black with their faces covered by niqabs. They had the kiddies in tow. Dad seemed to be ostensibly calling the shots as they bought up everything in sight. Otherwise a mad mix of Europeans, quite a crush the closer we got to the arch. There were supposed to be two big music superstores. The Virgin store was closed. I asked a guard where it had gone. He informed me that there were no more Virgins in Paris in broken English. Hmmm. No surprise really. I should think not. I've never seen so many statues of quite anatomically correct + detailed naked people in my life. But I passed on any further commentary. Fnac, the other French chain store was okay but we had trouble getting served in English. We were basically ignored and the clerks would just walk away + pretend they didn`t see or hear us. Blow us off for our poor grasp of French. Noses in the air, pickle up their butts. First time I've experienced that this trip. They had a good jazz and blue collection. I found some good discs but quite frankly they were very overpriced as well. Up the Champs thru the shopping district. Finally we reached the Arc de Triumph. It is truly magnificent. A giant relatively sparse Roman style redux stone block design with an tall arch in the middle surrounded by a traffic roundabout. There is an underground tunnel so you don't have to risk crossing the very busy street. We walked about admiring the ornate carvings, masonry, sculptures, plaques and tributes to the various conquerors who have come and gone, marching with great fanfare under the arch, mostly French. 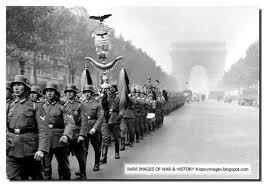 The Nazi's grand entrance thru the Arc de Triumph in June 1940. 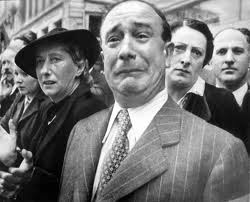 I`ve seen many infamous photos of Hitler at the Eiffel tower, the Nazi troops marching in through the Arc to occupy Paris in 1940. Little to no mention of that here. One plaque honours the underground resistance fighters, and another of course was an engraved quote by General Charles De Gaulle urging everyone to fight on. I saw a photo of his grand return marching through the arch with the French free fighters backed by a huge column of American troops in a museum display atop the arch. Mostly though, the Arch of Triumph honours the heroes of the Revolutionary and Napolionic wars. The French were not impressed! Stiff resistance would follow. We paid the fee to go up the spiral staircase. What a climb it was, but the rooftop view of Paris was breathtaking, well worth the effort. Oh yes, I bought an Arc de Triumph paperweight as a souvenir of our trip from the rooftop souvenir shop. Back on the Champs we walked about checking out the little restaurants and sidewalk bistros. A cheeseburger cost 22 Euros, the equivalent of about $30. Why would anyone buy a cheeseburger in Paris? Indeed, they understand our hamburger culture about as well as our coffee one, that is to say, not at all. Still it was about the cheapest item on the menus which were mostly all written in French, with translations available in most every European and Arabic language but very, very few in English. Even a French or German beer was cheaper than a bottle of Coke a Cola, one litre costing about 15 Euros. They don`t mind serving you that in English as long as you pay through the nose for it. We kept on walking until we found a so so sandwich shop. I picked up a couple of bottles of water to take back to our room. Most everything in general closes early in Paris except for the night life; restaurants, clubs and bars. I have yet to see a corner store, let alone one open late. So it was a good day. We are exhausted by all the walking and scenery. The architecture, like the art is quite exquisite and rich in history and different styles. However, I personally find it too ornate for my own tastes. Its all too busy and grandiose, even overdone. Too much so and it all clashes, but that's just me. Most of the people are very pleasant with us but I do sometimes note an underlying chip on the block towards anything English. It must weigh a ton for some of them. They can be quite snobbish and unbecoming. Parlez vouz a screw you I say! Part of an older statue now in museum atop the arch. The Paris Metro [subway] is dirty, hot and sweaty. The trains and tunnels are a lot bigger and wider than in London. The station crews are very helpful and cheerful. I find it rather odd that you have to open the doors yourself at each stop to get on or off. Bleech! Can you imagine how many tens of thousands if not more icky hands must touch the latch or button every day? Definitely a faux pas in the health and safety department. There is so much to do and so little time to do it this trip. Paris is a beautiful city, very European, more so I think than London. But London is rich in history and culture too. The people seemed more familiar, down to earth and I preferred the less hurried pace. We have one full day of adventures let here. It is all going so quickly, but then we did book a whirlwind trip and it is a lot of fun.